Branch Brook Park is located in my hometown of Newark, NJ. We took a ride to the park yesterday (Apr 10th) to see the cherry blossoms. Branch Brook Park was created in 1895 making it the first county park in the nation. It has the largest collection of cherry blossom trees in the world… more than Washington, DC and more than Japan. The cherry trees were a gift donated in 1927 by Caroline Bamberger Fuld. BBP is 360 acres and has almost 5000 cherry trees. The Cherry Blossom Festival runs for two weeks, the Bloomfest is April 18th… during which time the cherry blossoms should be at their peak. But, Mother Nature with her whimsically weird sense of humor has fast forwarded almost everything this Spring and so the cherry trees bloomed in all their glory … last weekend. The cherry trees still look beautiful. The cherry trees below are along Second River which forms the border between Newark and Belleville. 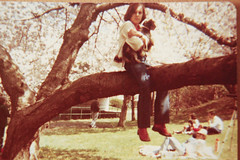 In the tree below sits Deb and Chappy There was supposed to be an accompanying picture of Deb and our first mini-dachshund, Mustard, sitting in a tree at BBP in 1979 but unfortunately I can’t find the picture. Update… Deb found the missing picture which is posted below… thanks Deb. It was a beautiful day to be out in the park enjoying the fresh air, the beauty of nature and recalling fond memories of Branch Brook Park. Please visit my photo blog Through Jersey Eyes for more pictures. Categories: Information, New Jersey, Photographs | Permalink.